Just this morning I finished up my grading for my large undergraduate lecture class. 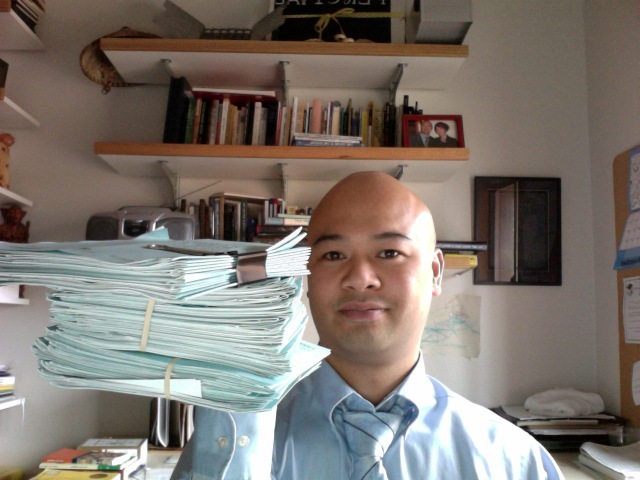 That's the very hefty stack of blue book examinations that I graded this past week. And yes, I'm wearing a tie. The tie's only because I have a lunch with the "suits." I can't wait for the break! I've got all sorts of things I want to work on, starting with putting a table of contents together and sending out work. I haven't had the opportunity to do any of those things with my teaching load this quarter. The load should significantly lighten now that I am no longer the academic adviser for the major and since I'm no longer teaching my large lecture class or my grad class, both of which were semi-new and new teaching preps. What do you want for Christmas? I want someone to pay off my credit card bill. My two and a half year old is really enjoying daycare. Mere and I are debating whether we should keep him there for five days out of the week. 1) it's expensive and 2) on Mondays, Wednesdays and Fridays, he'll be in there for quite a long time. But the other thing we've noticed is his language and his independence has really picked up. He's putting on his shoes and coats by himself and he's becoming a more social person. 3) Finish writing letters of rec.